Following production cuts mandated by Alberta’s Premier in early December 2018, Adrian Lara, Senior Oil and Gas Analyst at GlobalData, a leading data and analytics company, offers his view on the impact on the upstream sector. “The curtailment is not a long-term solution and it brings to the fore the more persistent issue of not being able to timely build the required infrastructure in Alberta. This is by no means a recent problem and has become a concern for province and national governments. “To date, three main pipeline projects are announced for transporting crude oil from Alberta, significantly reducing the infrastructure bottlenecks. However, all three pipelines face uncertainty due to pending approvals, activists’ opposition and construction delays; and in any case none would be fully operational before 2020. “At the moment, the province has an estimate of 16 million bbls of excess crude oil in storage and as result, the price of the oilsands benchmark, West Canadian Sour (WCS), has been trending downwards and during the last quarter it reached historically low values of US$12 per barrel or US$48 of discount to West Texas Intermediate (WTI). With no significant new pipeline capacity or additional rail transport availability, the curtailment was the strongest and quickest signal to the market for stabilising this price. “The market intervention is definitely uncommon for the liberalised Canadian oil markets. 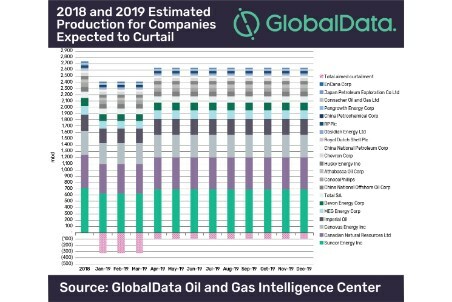 The curtailment will have to gradually dissipate in favour of the additional transportation capacity for oil sands output to continue growing.